George Graham Reviews My Brightest Diamond's "All Things Will Unwind"
One used to hear the expression "Who's afraid of classical music" some years ago when record companies were trying to find audiences among pop music fans, often with so-called "crossover" music. It has also been used a lot by orchestras trying to lure rock and pop fans to their concerts. Back then, there was a rather bright line between classical and rock, even though there were numerous attempts to breach the divide through art rock and orchestral pop projects going back to the Beatles. These days, many of the current generation of musicians who get conservatory classical training are likely to play in a rock band on the side and have an understanding of both sides of the spectrum. And increasingly, the genres are being mixed without a thought as to its being unusual. In recent years we have seen a lot of interesting examples, such as long-running rock artists like Peter Gabriel and Sting doing orchestral albums as well as younger generation performers like Sufjan Stephens popularizing the mixing of pop and orchestral instruments, as well as artists with a classical composition background applying some of those principles to a pop album. We recently reviewed a recording by Gabriel Kahane, an experienced orchestral composer doing a fascinating singer-songwriter record. And a while back, Scottish orchestral composer Craig Armstrong made a very interesting CD of full symphony-orchestra music mixed with techno. This week, we have an absorbing and quite enjoyable recording by another artist who brings a classical background into her music, and is joined by an eclectic chamber ensemble. 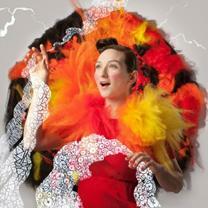 The group name is My Brightest Diamond, and the CD is called All Things Will Unwind. My Brightest Diamond is the name for the musical projects of Shara Worden. And joining her on this CD is a New York based chamber group called yMusic. Shara Worden grew up in Michigan in an eclectic musical family. Her father is a well-known accordionist, and her mother played organ. Growing up, she said she was equally passionate about classical and Motown. She attended the University of North Texas for a degree in opera, and while there started composing. Then she moved to New York, did three albums under her own name, before joining Sufjan Stephens for his Illinoisemakers projects and tours. After further studying composition, she began writing scores for several off-Broadway productions. She recently returned to her home state, moving to Detroit to start to raise a family. Some of the songs on the new CD were inspired by the birth of her son. All Things Will Unwind is the third full-length CD by Ms. Worden as My Brightest Diamond, but it marks her collaboration with the eclectic chamber ensemble. yMusic features woodwinds as prominently as the strings, and the arrangements are full of clever and often quirky turns that sometimes have a cinematic or theatrical quality to them. Ms. Worden herself, with her opera studies, certainly has the voice to pull off this interesting music. She said that she wanted to rely as much as possible on yMusic. On her website, she lists three rules she had for this recording: One, that all instruments would be acoustic. Two, though she is a multi-instrumentalist, that she would play as infrequently as possible. And three, if she did play, the instrument she played must fit in a suitcase. So she plays things like ukulele, thumb piano, and autoharp. yMusic has greater leeway in what they played: oboe, clarinet, French horn, violin, viola, cello plus -- to keep it acoustic -- a pump organ. The result is thoroughly intriguing album that has lots of interesting, and sometimes surprising sonic colors, with intelligent, lyrically astute writing, and impressive vocals. All Things Must Unwind, the new third CD from My Brightest Diamond, the musical project name taken by composer, vocalist and multi-instrumentalist Shara Worden, is a very creative mixing of classical orchestral and pop elements. The key to this album is the chamber ensemble yMusic, performing Ms. Worden's compositions and arrangements, which are often intriguing, occasionally quirky, but always well-written and beautifully played. And Ms. Worden's vocals are fully up to the challenge of the unconventional material. Our grade for audio quality is a "B." The CD is well-recorded and mixed, with the acoustic instruments maintaining their sonic colors, but we'll deduct points for the ham-handed volume compression used on the CD which erases much of the dynamic range of this music which should range from whisper quiet to jump-out-of-the-speakers loud, like a good classical recording, but instead is squeezed into a rather narrow volume range. There has been a long history of mixing classical and rock. But it's rare to have both aspects as closely integrated and with such a distinctive sound as My Brightest Diamond's new release.